In my role as the Dean of the College of Business, Law and Social Sciences, I provide executive leadership for the College. I’m also responsible for driving change, growth and sustainability across the College and its component schools. As a Pro Vice-Chancellor, I support University-wide initiatives, programmes and projects, such as leading the University’s strategic investment prioritisation group. I also help shape the University's policies and strategies. 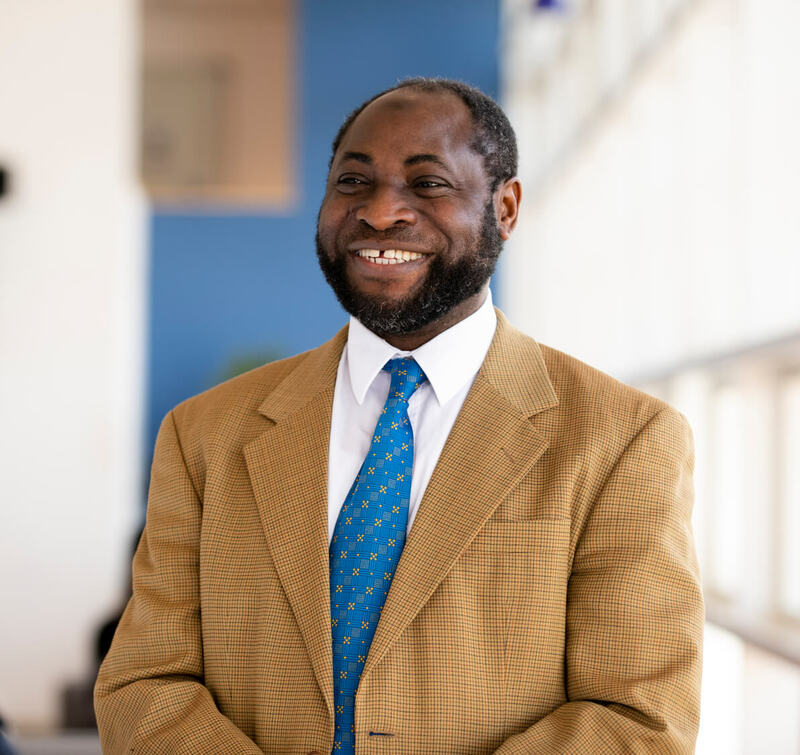 I began my academic career in 2001 at Lagos State University, Nigeria, after six years of working in different accounting and auditing roles in both public and private sectors. Between 2003 and 2013 I held different academic positions including Principal Lecturer and the Director of Postgraduate Programmes in Accounting at De Montfort University, Leicester. Prior to joining the University of Derby, I was the Head of the School of Economics, Finance and Accounting at Coventry University, where I led a number of strategic initiatives that drove change, growth and reputation. I’m the Chair of the Centre for African Resources Research and Development. In addition to my leadership responsibilities, I supervise postgraduate and doctoral students in the areas of accounting, auditing, accountability, governance and management. My background as an Auditor in an accounting practice provided me with necessary insights into the fields of corporate accountability and governance and the motivation to make a meaningful contribution to these. My goal for researching into these areas is to provide practical solutions to the challenges being faced by auditors and directors in satisfying corporate stakeholders. The quest for finding solutions to these agency problems has also led me into exploring ways through which growing IT capabilities can impact on corporate accountability. Engagement with the Accounting profession has been central to teaching, research, enterprise and knowledge exchange priorities. I hold a professorial chair in Accounting and Governance as my research interests cover Accounting, Auditing, Accountability, Governance and IT. I am widely published in these fields and I serve on the Editorial Board of a number of Journals. One of my recent papers entitled “The role of Auditing in the Management of Corporate Fraud” published in Developments in Corporate Governance and Responsibility was selected as the Outstanding Author Contribution for the 2015 Emerald Literati Network Awards for Excellence. I was also a Principal Investigator on an Innovate UK/EPSRC funded project worth £800,000 on the deconstruction and recovery of information modelling (2016 - 2018). Boolaky, P., Omoteso, K., Ibrahim, M. and Adelopo, I. (2018) The Development of Accounting Practices and the Adoption of IFRS in Selected MENA Countries, Journal of Accounting in Emerging Economies, 8(3): 327 – 351. Omoteso, K. and Yusuf, H.O. (2017) “Accountability of Transnational Corporations in the Developing World: The Case for an Enforceable International Mechanism”, Critical Perspectives on International Business, 13(1): 54 – 71. Emerald. Yusuf, H.O. and Omoteso, K. (2016) “Combating Environmental Irresponsibility of TNCs in Africa; An Empirical Analysis”, Local environment: the International Journal of Justice and Sustainability, 21(11): 1372 -1386. Boolaky, P.K. and Omoteso, K. (2016) “International Standards on Auditing in the International Financial Services Centres: What Matters?”, Managerial Auditing Journal, 31(6/7): 727 – 747. Aziz, U.F. and Omoteso, K. (2014) “Reinforcing Users’ Confidence in Statutory Audit during a Post-Crisis Period: An Empirical Study”, Journal of Applied Accounting Research, 15(3): 308 – 322. Omoteso, K. and Mobolaji, H.I. (2014) “Corruption, Governance and Economic Growth in Sub-Saharan Africa: A Need for the Prioritisation of Reform Policies”, Social Responsibility Journal, 10(2): 316 – 330. Omoteso, K. (2013) Audit Effectiveness: Meeting the IT Challenge, Hampshire: Routledge (ISBN: 978-1-4094-3468-9). Lopez Gavira, R. and Omoteso, K. (2013) “Perceptions of the Use of Virtual Learning Environments in Accounting Education: A Comparative Evaluation of Undergraduate Accounting Students in Spain and England”, Accounting Education: An International Journal, 22(5): 445 – 466. Omoteso, K. (2012) "The Application of Artificial Intelligence in Auditing: Looking back to the Future" Experts Systems with Applications: An International Journal, 39(9): 8490 – 8495.